This is where the eight people spent more than two years in hiding. “The Diary of Anne Frank” by Frances Goodrich and Albert Hackett is the true and ultimately tragic story of how eight Jews hid from the Nazis during World War II only to be betrayed and captured. Center REPertory Company is presenting the adaptation by Wendy Kesselman. Born in Germany, Anne Frank moved to Amsterdam, Holland, with her family to escape the Nazis when she was 4, but the Germans took over Holland in 1940. When Anne’s older sister, Margot, was ordered to a Nazi work camp in July 1942, the family hid in the upstairs annex of the factory where Anne’s father worked. They and four other people remained there until August 1944 when they were betrayed, arrested by the Gestapo and later sent to prison camps, where everyone except Anne’s father died. In this production, Anne (Monique Hafen Adams) is 13 when she, Margot (Maya Michal Sherer) and their parents, Otto (Victor Talmadge) and Edith (Marcia Pizzo), flee to the annex. They are joined by Mr. and Mrs. Van Daan (Michael Butler and Domenique Lozano) and their 18-year-old son, Peter (Kevin Singer). Later joining them is a dentist, Mr. Dussel (Michael Patrick Gaffney). In her optimistic way, Anne is exuberant at first and quite the pest, but they all soon get a dose of reality when Mr. Kraler (Paul Plain), a trusted friend who worked in the factory, gave them the rules. They had to remain absolutely silent between 8 a.m. and 6 p.m. when workers were downstairs. That meant removing their shoes, not talking and not using the only bathroom. Besides Mr. Kraler, their only other connection to the outside world was Miep Gies (Alison Quin), who brought them what little she could. 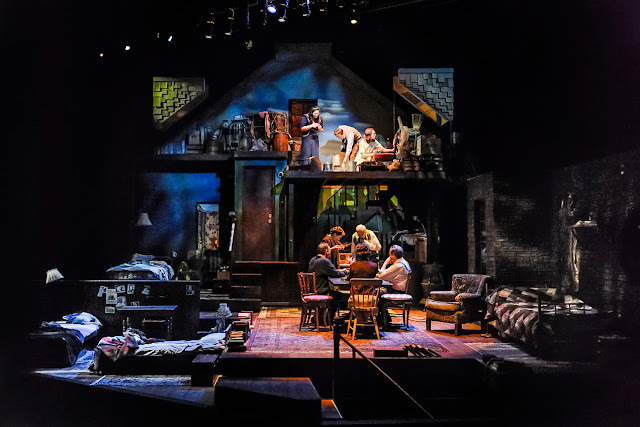 Thus eight people lived in cramped quarters (set by Nina Ball, lighting by Kurt Landisman) with meager food and almost constant fear of being discovered. fear was aroused when they heard a noise downstairs. Much to their relief, it came from a thief who fled. Although they tried to make the best of their situation, frustration and tempers inevitably erupted. Anne (Monique Hafen Adams) writes in her diary. Through it all, Anne wrote in her diary, revealing a hopeful, maturing girl with dreams and ambitions as her friendship with Peter blossomed. Everyone’s hopes soared with the Allied invasion of Europe in June 1944. They envisioned being free soon. Thus it was a terrible irony that they were rousted two months later and died before the camps were liberated in April 1945.
costumes and Teddy Hulsker’s sound and projections. Timothy Near directs this excellent ensemble cast with sensitivity and an eye toward helping the audience understand how these eight people lived. During intermission, for example, they remain on stage, going about their ways of passing the time. Nevertheless, it's difficult to imagine how one might endure such hardships, and it’s impossible to fathom the depraved inhumanity of the Nazis and their attempt to annihilate all Jews and other people they deemed undesirable. Hence when the cast takes its curtain call, the applause is warm but subdued. Afterward, the house manager remarked that it was unusual to see people so quiet as they left. That’s a tribute to the power of the play and this thought-provoking production. 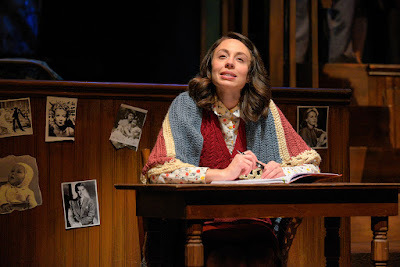 Running about two hours with intermission, “The Diary of Anne Frank” will continue through April 28 in the Lesher Center for the Arts, 1601 Civic Drive, Walnut Creek.